So you’re engaged (Congratulations! ), you’ve set a date and booked your venue... the next thing to think about is getting that date in your guest’s diaries as soon as possible. The creator of some pretty gorgeous wedding stationery Dimitria Jordan, chats to weddingplanner.co.uk about her best advice for writing and styling your save the dates. The lovely designer is also offering 10% off all save the dates for a limited time only, you can find all details on this at the end of the blog post. “Save the dates are great to inform guests well in advance of your special day, especially if it is a destination wedding, on a bank holiday weekend or during the summer months. Below are a few nuggets of advice as well as some design inspiration. Save the dates can be very minimal– the city and / or country and date is enough at this point. Guests will only expect full information with your invitation. Of course, you can also let guests know your venue for accommodation purposes if you prefer. “If you know you cannot make it at this stage, please kindly let us know by email (followed by email address)”. This will save on sending invitations out to them, and may mean you can invite another couple that there was previously no space for. For destination weddings, up to a year before is ideal to give guests plenty of notice. Otherwise, it is usually 6-8 months before your wedding day. 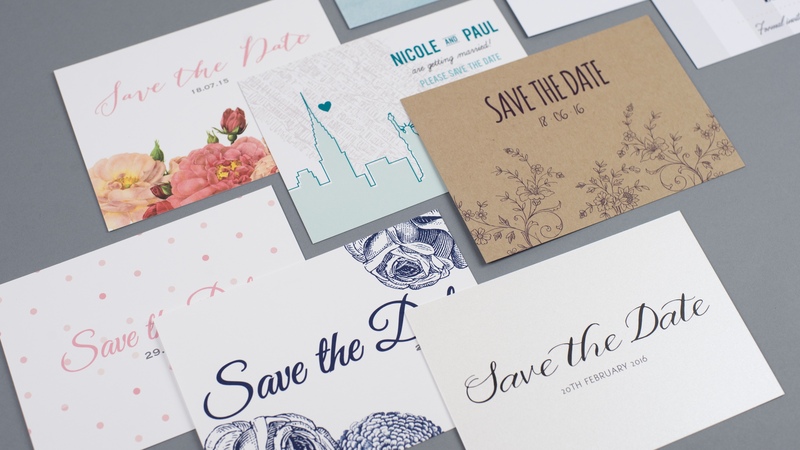 I haven’t decided on my wedding theme – do my save the dates have to match my invites? Don’t panic if you haven’t decided on your colours and theme yet. Many couples choose to send out save the dates that are not in the same design as their wedding stationery so this ultimately depends on you. If you already have a theme in mind, stationery collections will offer save the dates all the way through to your thank you cards, so everything can be in the same style. With this option, it is the first time your guests will see anything of your special day, so it is a nice way to set the theme from the very beginning. Are there any standard formats? There are no standard formats - this will depend on the style you choose. A few examples of different formats are magnetic, in the style of a tag, as a postcard, or as a standard design. Tip 1: Allow 4 weeks for the whole process to enable enough time for proofs, any changes, printing and delivery... whilst they are with the stationers, double-check all your addresses and chase those you don’t have! For a bespoke design, allow 4-7 weeks. Tip 2: Many collections can be adapted to your colour theme, so if you find a design you love but isn’t in your wedding colours do ask the stationer. Most of the time colours can be changed as part of your order or for a small surcharge. Save the Dates are the first glimpse of your day - so have fun deciding on the style and format! To claim your 10% off all save the dates, head over to Dimitria's profile here and enter the code WEDP10 at checkout. If you have any further queries, feel free to pop Dimitria a message here and do follow her on Social Media all @dimitriajordan. Dimitria Jordan is a wedding stationer who helps couples bring their wedding stationery visions to life. Whether it's stationery from a studio collection or a bespoke design, Dimitria provides a personal one-to-one service and believes in making the whole process creative, fun and stress-free. Her work has been featured in blogs such as Style & the Bride, and magazines such as Perfect Wedding and Khush. Congrats! You're a bridesmaid! ...Now what?